Threats to the environment are numerous. Diminished biodiversity, extinctions, habitat fragmentation or loss, climate change, pollution, altered hydrology… the list goes on. One of the most significant threats to nature today is the introduction and establishment of invasive species. A 2017 white paper from the Invasive Species Advisory Committee of the US Department of the Interior (DOI) states that invasive species, “are estimated to cost the U. S. economy over $100 billion annually, including impacts to business and industry, recreation, and public health.” And that’s economic impact, to say nothing about the damage to natural areas. A 2012 DOI fact sheet suggested that invasive species were having an adverse effect on half the endangered species endemic to the Great Lakes. Vegetation management is one of the most prominent activities associated with ecological restoration, and removal of invasive species is one of the most essential components of vegetation management. To put it plainly, most of the time and effort we spend on restoring our natural areas is spent removing or otherwise trying to control invasive plants. Of course, in addition to the vigorous and necessary work of vegetation management, there are other ways to engage as a volunteer in support of managing our natural areas. In 2018, our Citizen Science program will include opportunities to monitor a number of different species throughout the forest preserves. At the same time, any citizen scientist—indeed, any observer in Winnebago County’s natural areas—can share information about the presence of invasive plant species that are just starting to get established in the area. The New Invaders Watch Program (www.newinvaders.org), powered by the Early Detection and Distribution Mapping System (EDDMapS) is an online portal through which such sightings can be reported and shared. I am encouraging all our readers, citizen scientists, and other outdoor observers to keep an eye out for new invasive species and report them. Our own citizen scientists will be volunteering in the forest preserves and will be well situated to take note of any such new invaders. For those who will be doing plant monitoring we will share a list of invasive species that are seen as potentially troublesome and just starting to make inroads into Winnebago County. One such bad actor that is likely to make the Least Wanted watch list is oriental bittersweet (Celastrus orbiculatus), a woody, twining vine with round leaves and red/orange fruit capsules in the leaf axils. The vine can grow to be quite stout and has an unfortunate habit of strangling whatever tree or shrub it uses as support in its climb toward sunlight. The vine grows fast and spreads by underground rhizomes (as well as by prolific seed production). 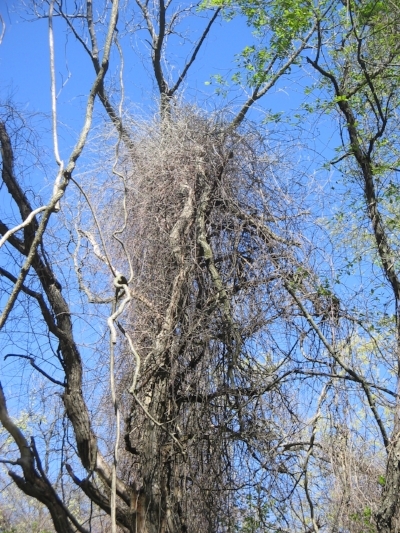 Through a combination of shading the host plant to limit its ability to photosynthesize and the sheer weight of its mass, the alien bittersweet actually can bring down mature canopy trees. The swelling trunk of the twining vine can girdle a young tree, much like a boa constrictor can strangle its prey. Oriental bittersweet (Celastrus orbiculatus) strangling a native hickory sapling. There is a native climbing bittersweet (C. scandens) that is not aggressive. It can be told apart from the invasive species by the location of flowers/fruits: instead of in the leaf axils, the flowers appear as a terminal raceme (i.e., at the branch tips). Anytime we can identify the presence of invasive species before they are able to establish extensive colonies or produce abundant seed, we stand a better chance of reducing their adverse impacts on our natural areas—and saving future generations the cost and effort of control attempts. If you can let us know when you find a new invader we can send someone out to verify the identification and, if warranted, take preventative action. We can avoid finding such masses of Oriental bittersweet entangled in the canopy of our woods if we can identify the vine early, before it gets well established.